Type of wine: Medium-bodied, fruity, lightly tannic red. 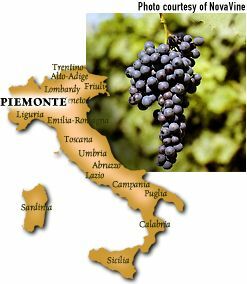 Origin: The "little sweet one" is, with Barbera, the favorite everyday wine of the Piemontesi. While several DOCs (Denominazione di Origine Controllata) produce Dolcetto, the most prominent are DOLCETTO D' ALBA and DOLCETTO D' ASTI. Description: Bright reddish-purple in color. Aromas of ripe blackberries and plums are mirrored in the flavors. A direct, Zinfandel-like fruitiness combined with Merlot-like soft tannins make Dolcetto charmingly seductive. Aging: Usually approachable and drinkable upon release, Dolcetto can develop further with two to three years cellaring. Best location: Hot, bright, sunny days and cool, foggy nights and mornings build the acidity and intense fruitiness characteristic of the grape. FastFoodFacts: The preferred mate to risotto with white truffles. Also fine with grilled Portobello mushrooms, spicy dishes and curries and tangy barbecued meats of all types.